The POE-PA2 is a passive PoE injector / splitter system that supports 5v, 12v, and up to 50 volt power over Ethernet transmission over CAT-5 cable. This product is used with non-PoE IP cameras and network devices. The POE-PA2 set contains two pieces: PoE injector and PoE splitter. The PoE injector has an RJ45 male plug, a male 2.1mm DC power jack, and an RJ45 female plug. The male RJ45 connects to a network router or switch. The power jack connects to the power supply that was included with your non-PoE device (such as an IP camera). A CAT5 cable connects to the female RJ45 plug and connects on the other end of the cable run to the female RJ45 on the splitter. The splitter also has an RJ45 male plug which connects to the IP camera or other non-PoE network device. 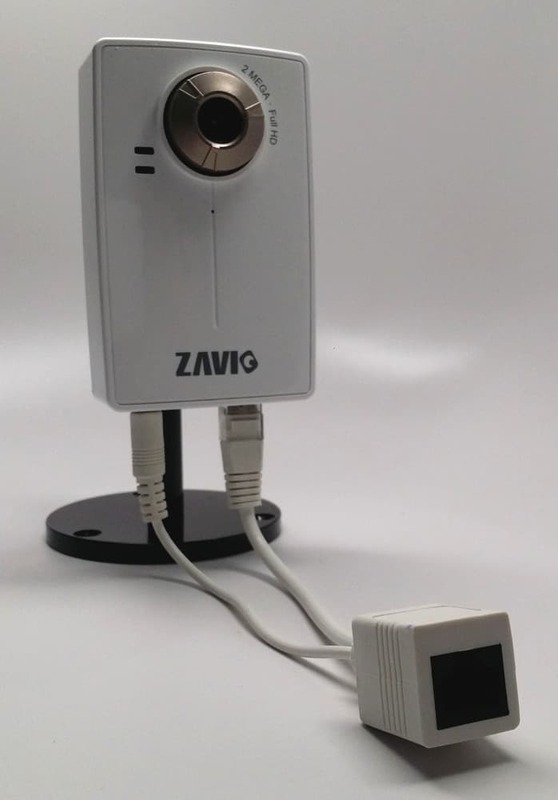 The 2.1mm female power plug connects to the power input of the IP camera (typically 12v or 5v DC). Please refer to this network diagram which illustrates this. Here is what the splitter side of the PoE-PA2 looks like when connected to a non PoE IP camera.